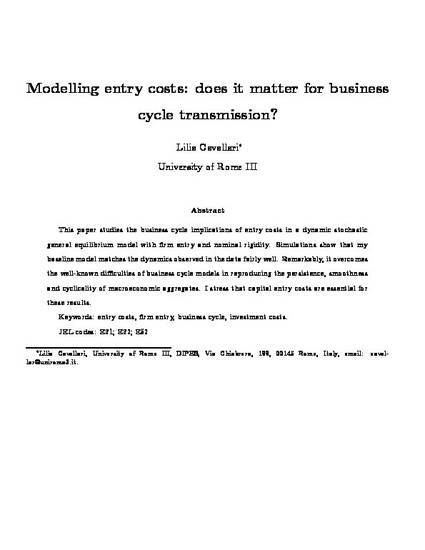 Modelling entry costs: does it matter for business cycle transmission? This paper studies the business cycle implications of entry costs in a dynamic stochastic general equilibrium model with firm entry and nominal rigidity. Simulations show that my baseline model matches the dynamics observed in the data fairly well. Remarkably, it overcomes the well-known difficulties of business cycle models in reproducing the persistence, smoothness and cyclicality of macroeconomic aggregates. I stress that capital entry costs are essential for these results.